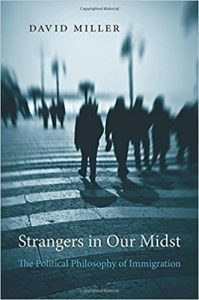 Published: April 24, 2018 | This entry was posted in North American New Right and tagged book reviews, cosmopolitanism, David Miller, Donald Thoresen, ethnic identity, ethnocentrism, human rights, immigration, immigration restriction, nationalism, North American New Right, originals, refugees, Strangers In Our Midst, xenophobia. Both comments and trackbacks are currently closed. While I agree that presenting liberal-based and human rights-based arguments against immigration and refugee resettlement can be useful in order to bolster the rhetorical and dialectical tools at our disposal, I think this type of approach has its problems. As with Bainer’s book on Dangerous Minds, there is an underlying assumption in Miller’s approach that only Liberal arguments are valid: anything that starts from non-Liberal, (True) Rightest assumptions is implicitly not allowed into the conversation. And once you have accepted that all of the Liberal and Human Rights-based arguments must be met on their own ground, you have significantly weakened your ability to refute them because one is implicitly investing them with moral authority. 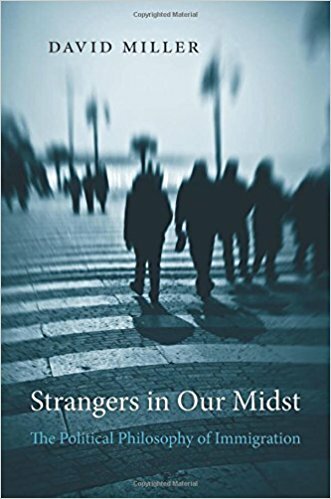 And indeed this is evidenced by Miller’s own weakness of conviction in his data and logic: If refuting the logic of free immigration while relying on liberalism and human rights were sufficient, why does Miller balk in the second half of the book? The answer is most likely not a matter of failing to convince himself based on facts and evidence. Rather, it is the weakness that inevitably follows from continuing to accept the moral authority and the legitimacy of the Liberal Dispensation. To put this in more concrete terms, were Miller to go before a true immigration restrictionist group of thinkers and supporters to present his case, I suspect that upon finishing his speech, he would need to say “Please clap.” Miller is just the kind of thinker who would be snapped up by Conservative Inc. think-tanks or even politicians such as Jeb Bush in order to present the “humane case for immigration restriction” purely in order to attract supporters whom he would then betray if he ever took power. Just as Miller cannot even turn his facts and arguments into any truly actionable conviction, any politician using this approach would walk out of the negotiating room with a “historic compromise” that maintains the status quo or worse. Again, this is not to say there is no value in Miller’s project: to refute the case for immigration on terms that liberals themselves accept is no small task. As a rhetorical matter, I find that getting people to focus on non-White First World or Second World countries, such as Japan, Korea, Thailand or Sri Lanka, has more persuasive power: All of the policies liberals deem to be evil and unthinkable in the West, are the least of what any rational country is actually doing in terms of immigration enforcement and policy. When a liberal visits Japan or Thailand, do they think they are entering a totalitarian hellhole engaged in unspeakable crimes? No, they tend to look on those places as models of peaceful, cultural cohesion. Pointing out their cognitive dissonance is one way to opening up their minds. Everything boils down to the fact that the West – Western Europe and America – is currently weak. People jump through hoops merely to justify the most basic principles: national territory and the right of a people to existence within it. The colored world has never forgotten this, which is how they long ago through off colonialism and even today continue to agitate, such as against whites in South Africa, for instance.